Not every meal can be a three star meal, nor should they be. As much as I love to get dressed up and be served beautifully prepared meals in exquisite surroundings, sometimes I just want to get down and divey as well, (not too divey. I do have some cleanliness issues). 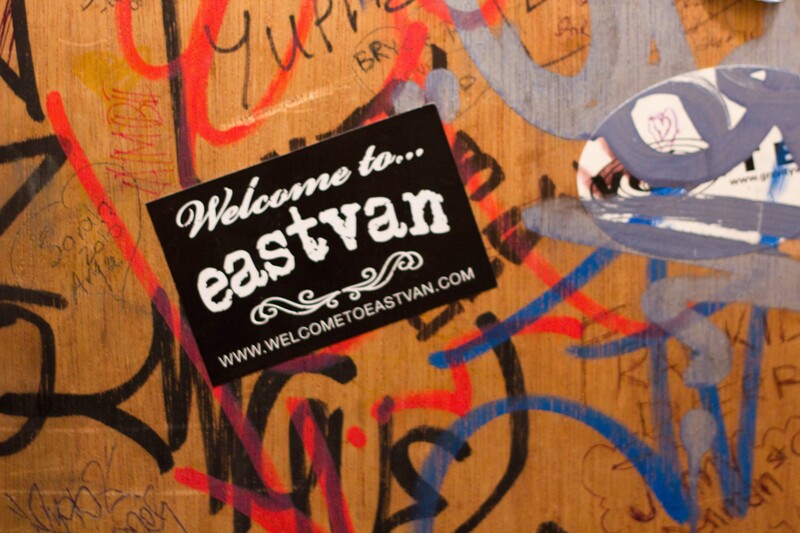 We wanted to check out the East Village cocktail scene on a Friday night so we thought no better a time to check out some of New York’s low-end eats. Our first stop was Angel Share. We’d been last year, but had a feeling that we’d be able to get in quickly on a Friday night. The secret to this place is that you go walk through Village Yokocho restaurant to the back and one of the wall panels is the door to Angel Share. This place was ultra-cool last year, but on that visit it was relatively quiet and we sat at the bar. On this visit, it was busy, loud and the crowd was fairly unattractive. We waited 15 minutes for a table and were sat in a cramped corner. It wasn’t all bad though, Angel Share has some great things going for them. Unlike most speakeasies, they have windows that look out into New York’s evening sky and the cocktail creations are amazing. Seeing as we weren’t going to have any interaction with the bartender, we ordered off the menu. I got a Summertime, which is a slushy of jasmine infused rum, lychee liqueur, blue curacao and finished with a flourish of champagne. Ben tried the Del Sasser made from bacon infused bourbon, plum liqueur, pomegranate and lime juice and finished with some balsamic honey. Ben’s was definitely the more unique of the two with the bacon adding a nice smokiness to the drink. When I was taking this photo to show where Angel Share is, I noticed downstairs there was a Panya, (Japanese bakery). Of course I had to stop in to get something. Bad move, the end of day cheese and corn bun I bought was stale. We’d been through Crif Dog last year on our way in to PDT (Please Don’t Tell), and in the back of our minds we thought we’d try to get in for a drink again if we could. 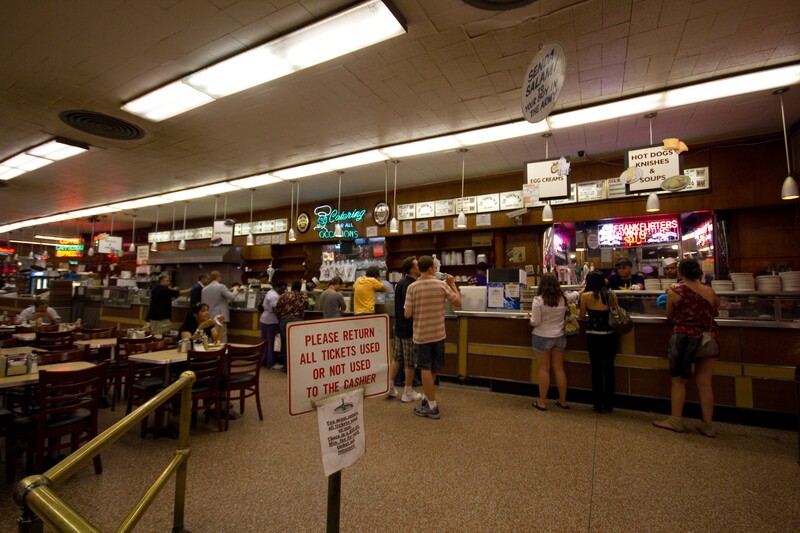 We tried calling earlier in the day for reservations, but they were full and told us to drop by to see if there was room at the bar. No such luck for drinks, we stepped in to the telephone booth, was met by a bitchy hostess and told they were full. No worries, when we saw the people who had scored reservations, we commented that the people were even more unattractive than those at Angel Share. We were really just there for the dogs anyways. A friend of mine kept hyping Crif dogs for its Chihuahua dog, but I wasn’t sold on the idea of sour cream on a hot dog. I did know that I wanted a bacon-wrapped dog because that’s my thing now. Deep-frying is the secret to keeping the bacon around the dog. 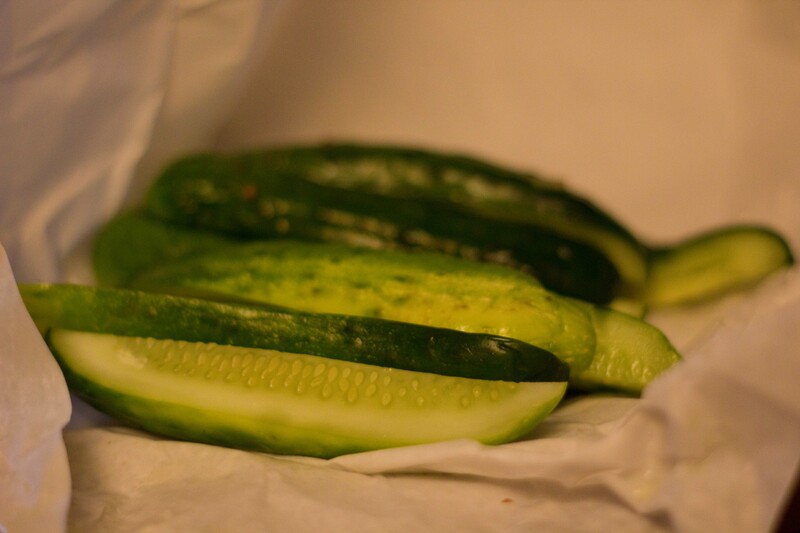 Deep frying is also the key to this plump and tasty treat. 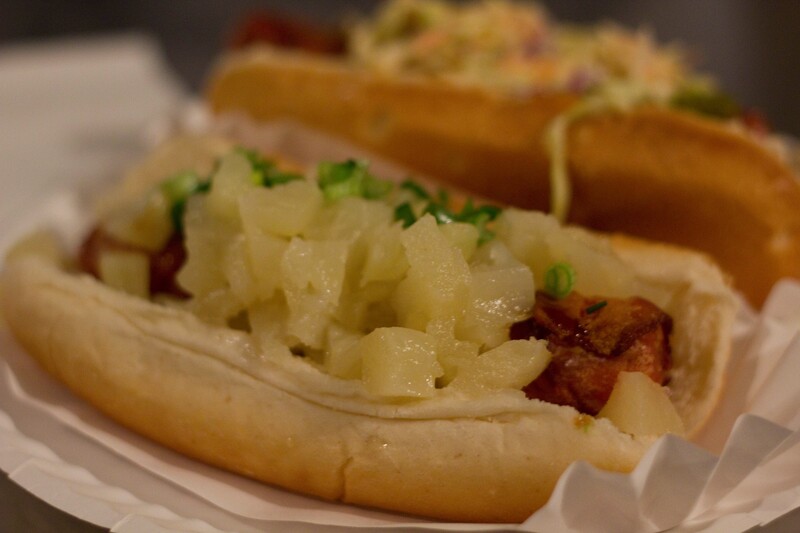 Tsunami – Bacon wrapped dog with teriyaki sauce, pineapple and green onion. The pineapple tasted a bit chemically, so I made Ben eat most of this one and I devoured the last two bites of his choice. 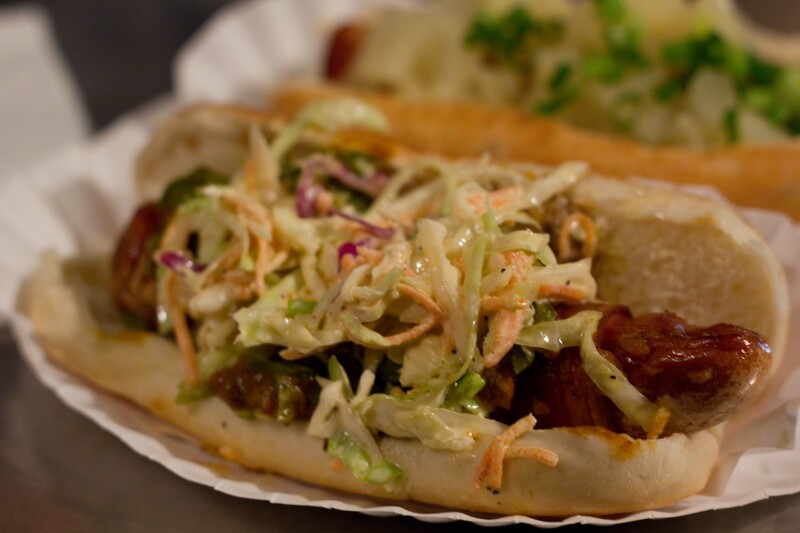 Spicy red neck – bacon wrapped dog with chili, cole slaw and jalapeno. The winner of the evening! We still hadn’t gotten a call from Mayahuel, so I decided that I should at least try the dog that had led me here in the first place. 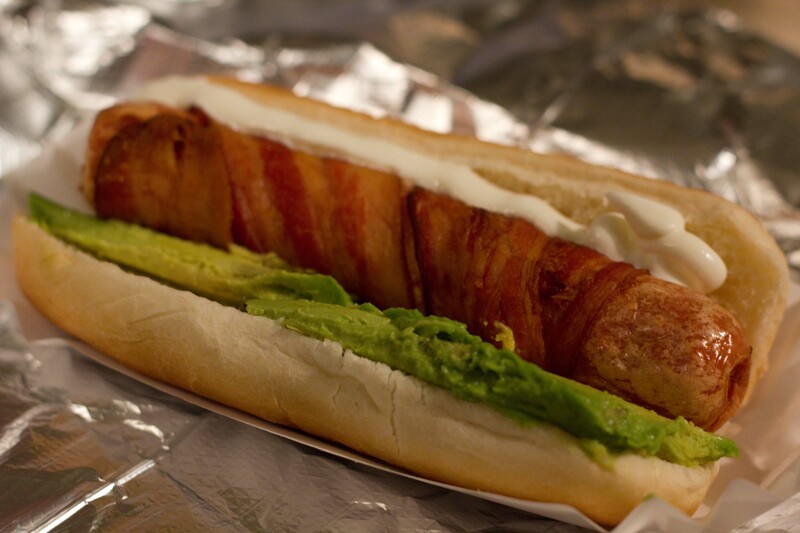 Chihuahua – bacon wrapped dog with sour cream and avocado. Good, made even better with the addition of sriracha sauce. I throughly enjoyed Crif dog but it’s not your traditional dog, so if you’re one of those purists looking for a true New York hot dog, this is not it. Found inside the door to the seedy washroom at Crif Dog. Seems that you’re never too far away from home. We got the call to Mayahuel and walked the few blocks over for drinks with a Mexican inspiration. 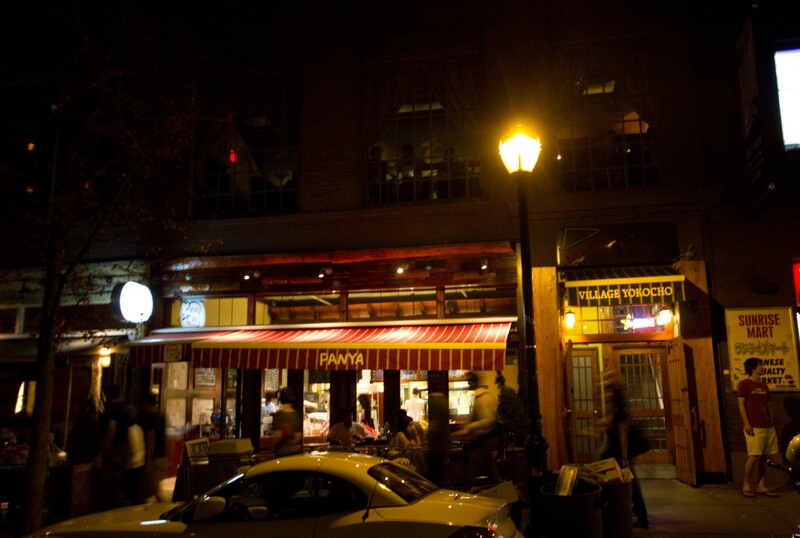 On the quiet end of the street, as with most speakeasies, you could not notice Mayahuel. There is a door guy, who takes your name, and is nice enough to call you when there’s a table ready. Inside, it’s dark, goth and nothing like any Mexico I’ve ever seen. The drinks are all tequila or mezcal based. My curiosity for mezcals turned into a fondness on my trip to Oaxaca a few years ago. But I’ve only had them straight, so I wasn’t sure what I was going to think about these cocktails. The Spicy Paloma with jalapeno tequila, grapefruit, lime and soda was nicely balanced drink of spicy and sour. The Trato Hecho with pineapple infused mezcal with lime, green chartreuse and maraschino was also good, but I think I’d rather my mezcal by itself sipped from a shot glass, than mixed-up all girly. 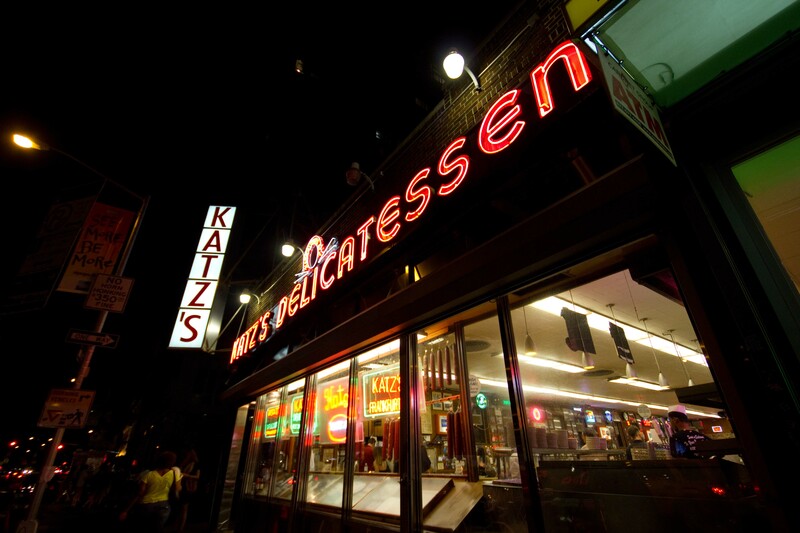 On our walk to the subway at the end of the night, I noticed that we were only a few blocks away from Katz’s. 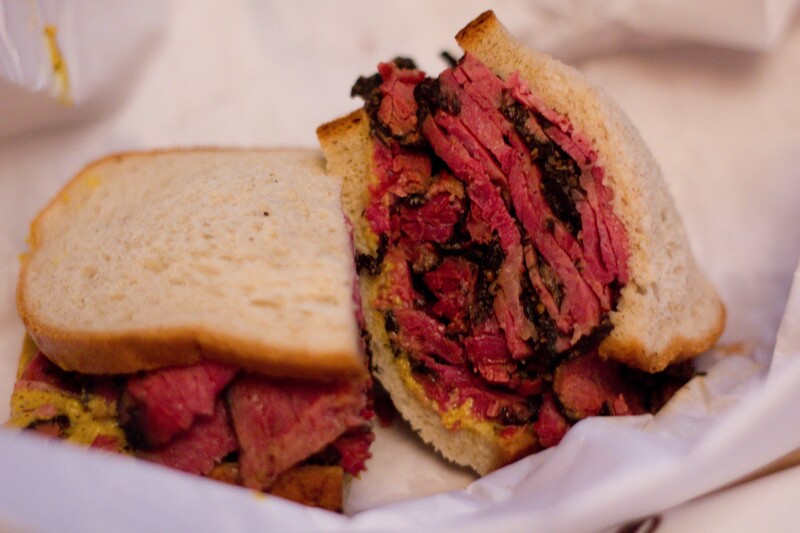 Knowing that a trip to Katz’s was not on our schedule for this trip, I mentioned it to Ben. Like a fat kid on a smartie*, he was in. My heart started beating faster as we walked closer. During the day this place is jammed packed. Late at night, it was just us, 1 cop, some fire fighters getting off shift and some post-drinkers like us. Going when it’s not busy, you get a bit more attention from the guy who makes your sandwich. 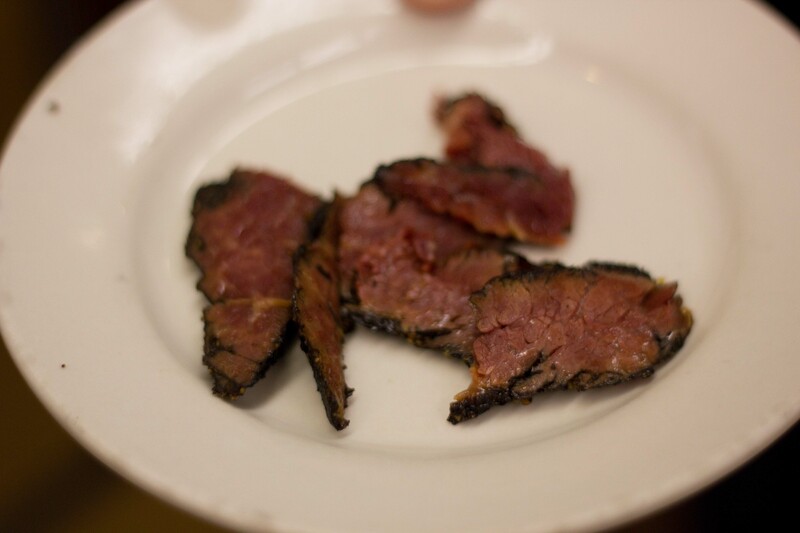 Put a buck in the tip jar and you’ll get some pastrami tasters while you wait. Jump around and squeal like an idiot, you’ll get another helping and some corned beef to try. 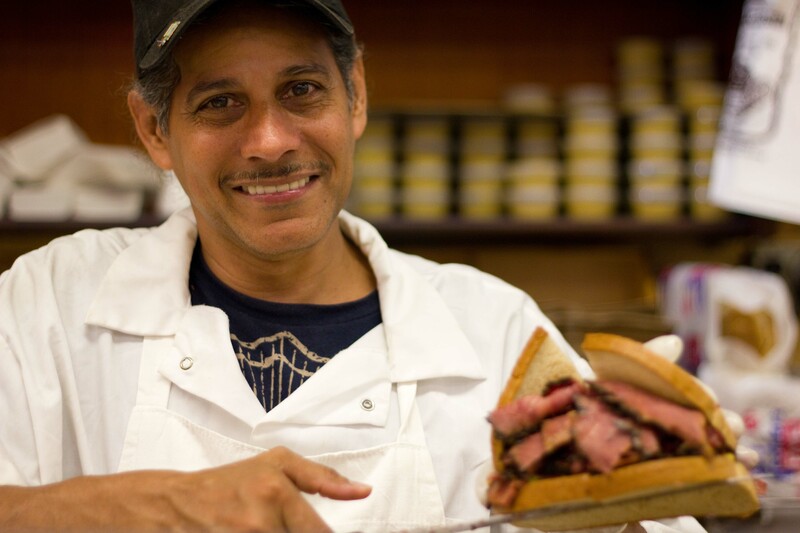 Jump around, squeal and clap your hands and you’ll get a sandwich that’s even bigger than the norm. And by yelling out “Yay, half-dones are my favorite!” you may even be lucky enough to be given 2 more. Eaten while it was still warm back at the hotel, Katz’s pastrami sandwich was again one of the most memorable tastes from the trip. I’ll apologize now to those of you reading this and wondering if we brought some back to share with you, (you know who you are) because unfortunately we did not. Although sitting here now looking at the photos, I wish we did too. *My husband Ben uses lots of funny sayings, most of which I’d never heard before I’d met him. “Like a fat kid on a smartie” is one of his favorites to let you know he’s in to doing something.